The Tainos, Jamaica's native inhabitants, lived a fairly peaceful and untroubled existence until the arrival of the Spaniards in 1494. Clues to their early existence can be found at Mountain River Cave located in the lush green terrains of Cudjoe Hill, St. Catherine where there is a large collection of Taino art. It is fairly accessible and it is reached via St. Johns Road which leads to Browns Hall. On reaching Cudjoe Hill there is a sign, placed by the Jamaica National Heritage Trust which indicates that Mountain River Cave is nearby. However, before you begin the journey to the cave it is advised that you contact the Jamaica National Heritage Trust (JNHT) at 922-1287/8 who will provide a guided tour. The mile long trek to the cave from the main road passes over a winding river. Cultivations of cocoa, jackfruit and other native plants provide shelter from the sun, and tantalize the senses with their strong, distinctive smells. For a more comfortable walk sturdy shoes or boots are recommended. Mountain River Cave was first reported in 1897 by J. F. Duerden. In 1954, its position was pinpointed by J. W. Lee aided by Robert Cooper, whose family owned the land. 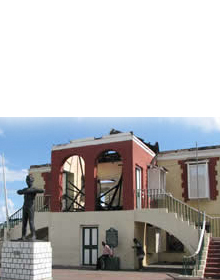 Realising the potential of the site, the Archaeological Society of Jamaica acquired it in 1976, and with the assistance of some private individuals and institutions began to develop it. 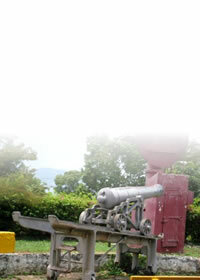 The protective grill at the entrance of the site and the guard rails were designed and installed by the Jamaica Defense Force (JDF). In May 1982, the Archaeological Society presented the cave as a gift to the JNHT. 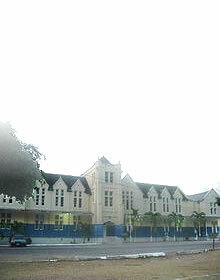 The site was declared a national monument in April 2003. The cave itself is relatively small measuring 100 feet in length, 30 feet in depth and with a ceiling ranging from 10-15 feet. It is located in a thickly wooded area within the sound of water, cascading down a rock face in the river bed. It is not sure whether the Tainos lived here, but we do know that they visited it from time to time. On their visits the Tainos apparently drew many pictographs (paintings) in the cave. There are a total of 148 identifiable pictographs in the cave although the number may well exceed over 200. There are about 4 or 5 petroglyphs (rock carvings). The exact age of the artwork is unknown, but experts estimate that they may be between 500 to 1300 years old.